First published in 1869, Sentimental Education is the story of a narcissistic young man called Frédéric Moreau and his journey towards maturity. He comes of age in yet another French Revolutionary period, the novel spanning the years 1840-1851, and beginning as the July Monarchy of Louis Philippe began to crumble under the weight of discontent from both the left and the right. So turbulent events form the background even though Frédéric is much more interested in himself and his messy love life. Like Zola’s novels which document the state of the nation, Sentimental Education is also a very good exploration of the human heart. The novel begins with Frédéric falling in love with a glimpse of Madame Arnaux. He falls in love, that is, with an idea of love more so than the person, and this idealised woman-on-a-pedestal becomes an obsession. Madame Arnaux is the wife of a wily art dealer and the mother of two children, Marthe and Eugene. At first Frédéric has no hope of forming a liaison with her because his mother’s fortune is encumbered and he has to make his own way in the world. (Which in that era, meant forming useful relationships.) Frédéric is clever, and despite doing very little work he eventually gets through his law exams – but he doesn’t have the wherewithal to live in Paris and pursue his dream. Frustrated ambition makes him despair. He is, however, encouraged by his good friend Charles Deslaurier, a former schoolmate and another who must make his own way and who plans to be a lawyer. And while he’s moping about at home in Nogent, Frédéric also becomes friendly with Louise Roque, the illegitimate daughter of a neighbour and his maidservant. Louise is much younger than Frédéric, and the neighbourhood looks down on her, but he is kindly to her in a paternalistic way, not realising that she and her father have designs on him. The rich uncle expected to include Frédéric in his Will dies intestate and Frédéric gets the lot. Back he goes to Paris where he spends a formidable amount on clothes, furniture, and a carriage. He inveigles his way into the Arnaux household partly by buying artworks from Arnaux. The flaws in his character emerge as his impulsiveness leads him to make over-generous tips and buying things merely as a ruse to spy on Madame Arnoux’s whereabouts. His vague ambition is to go into the Council of State, and his mother is keen for him to make use of a connection with the wealthy banker Dambreuse, but Frédéric wastes his opportunities because of his obsession with his would-be romance. It’s a romance doomed to failure because in putting Madame Arnaux on a pedestal, he has made her unattainable. He admires her virtue so much that he cannot possible seduce her without destroying the honour that he finds so appealing. 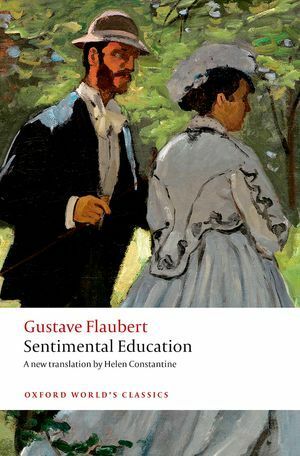 Flaubert notes that for certain men, the stronger the desire, the less likely they are to act and Frédéric’s life at this time is marked by indecisiveness at every turn. The Arnaux marriage is ill-matched, and he listens to both husband and wife complain about each other in the hope of triggering a separation. He comes late to the realisation that Madame Arnaux would never harm her children by a separation, and moreover, M. Arnaux still fancies his wife. The reader watches in dismay as Frédéric’s money is frittered away, (as Frédéric’s mother would also have done, had she known about it). Arnaux gets himself into financial strife, and Frédéric rescues him with a substantial loan secured by a meaningless guarantee. This was money that he had impulsively agreed to invest in a publishing proposal of Deslauriers, putting at risk a friendship already strained by differences in wealth and status. Arnaux, of course, doesn’t repay this loan and Frédéric is shamed by his broken promise to Deslauriers, but he is too embarrassed to press for repayment. Before long, Frédéric realises that he needs to resurrect his would-be career in the Council of State and makes contact with Dambreuse to facilitate the right introductions. This leads to the emergence of Dambreuse’s wife as another who has designs on our hero: a haughty society lady, she is in marked contrast to another who is hopeful of Frédéric’s heart, the courtesan and mistress of Arnaux, Rosanette Bron. (She’s 29, you see, and so not only is she getting on a bit, she’s also tired of juggling lovers). Naïve, narcissistic, headstrong and impulsive, Frédéric is a fool but the reader feels a sense of irritated pity for his folly. Some may judge him harshly, but there’s no malice in him. He’s just a fool, with too much money. In Part II, his troubles multiply. He gets into a farcical duel to defend Arnaux against allegations that he’s a crook; he still hasn’t got his money back (it was 15,000 francs) and Rosanette is pressing him for money not because she needs it but because it’s a way of tying him to her. When he goes home to Nogent to sort himself out, his mother and Old Roque conspire for him to marry Louise. Roque, who is quite wealthy, wants to make his daughter a Countess, and marriage to Frédéric would enable them to resurrect an old title derived from Madame Moreau’s noble ancestry. But marriage talk and Frédéric’s own impulsive declaration of love makes him feel trapped, so he goes back to Paris. Flaubert renders the fall of the monarchy with great power. Scenes set in salons depict intellectual torpor amid the luxury enjoyed by the upper classes. The intellectual indolence of the powerful is in marked contrast to the passionate discussions that take place among Frédéric’s younger companions from law school: Baptiste Martinon, Sénécal, Regimbart and of course Charles Deslauriers. While a lot of their talk is just hot air fuelled by alcohol, these characters have at least a vision inspired by their respective ideologies. The wealthy are merely interested in money, secured by any government that offers stability and social status. Almost everyone, however, has to sway with the wind as the monarchy falls and an incompetent republic takes its place. Coleman acknowledges what some will see as a flaw in this novel, a disappointment with the expectations raised by the title. He refers to Henry James’ criticism that Frédéric is so vague in thought and ineffectual in action that even his failures fail to instruct. Well, Frédéric does emerge at the end of the novel as a somewhat wiser man, but the narrative refuses to judge him, any more than Madame Bovary is judged in the novel of the same name. These issues, I expect, are the subject of undergraduate essays and perhaps discussion questions among book groups reading the classics. For myself, I quite like the tenderness with which this foolish young ‘hero’ is portrayed, and felt the same kind of tolerant dismay that perhaps his mother might have felt about his failures*. But *chuckle* I am quite sure that I would not have felt that way had I read this as an assertive young feminist, and I don’t think I would have been amused at all when I read the bit where Flaubert pokes fun at a feminist’s demands on the new revolutionary government. *(If there is a flaw in this novel, it’s the stock characterisation of Frédéric’s mother). While I did find some of the detail a bit overwhelming in places, this edition is a very fine translation by Helen Constantine, and IMO Sentimental Education deserves its place in 1001 Books. Someone (I can’t remember who) once told me that he thought this book was best read when young–that it’s a young person’s book. I’ve read it and tend to agree that perhaps its best appreciated by the less jaded. What do you think. Thanks. I wish I’d read it when I was younger, but there you go. Thanks for this. I have added it (and Salt Creek) to my reading list. I keep meaning to read this book together with Bouvard and Pecuchet. I only have an old translation with no notes—would you advise reading a more modern translation with notes? Yes, I would, and for the reason to do with Flaubert making so many references to people and events that were in living memory at the time. Even though I’ve just finished reading all those Zolas, and I’ve also read the whole Comedie Humaine, there were still lots of allusions I had to look up. There’s a complete list of all the people alluded to, and notes, and an introduction (though I must say that the introduction is a little lofty for my taste). I read this before I was twenty and I remember I liked it. I don’t know how I’d like it now. I tried to reread La chartreuse de Parme, one I had liked when I was still a teenager. I had liked it a lot then but couldn’t finish it this time around. I found Fabrice Del Dongo exasperating. *chuckle* Time confers perspective, eh?